The Katonah Museum prompts a debate with a provocative and interactive approach to portraiture. Eye to I explores the countless ways individuals experience imagery. Interpretive copy written by over 100 contributors – from a U.S. poet laureate to a local police officer – offer personal responses to the 60 portraits on display. Interactive video touchscreens offer visitors opportunities to contribute their own observations. 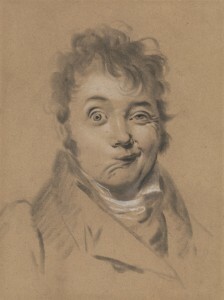 Borrowed primarily from private collections, the range of portraits is exceptional and few have been publicly exhibited. The earliest works include a carved Egyptian bust of Amenhotep III, dating from 1,500 BC, and a marble sculpture of a Roman priest from 125 AD. The exhibition features portraits from Europe, Asia, and South America. Sponsorship provided by Janet Benton, Karen B. Cohen Foundation, Judy and Tony Evnin, Betty Himmel, Alexia and Jerry Jurschak, Kendal on Hudson, KMA Docent Supporters, Victoria and Stephen Morris, Yvonne and Leslie Pollack, and Frank and Lisbeth Stern.